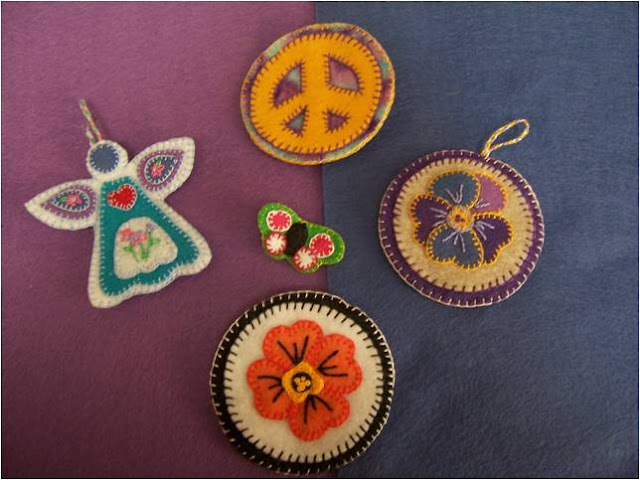 This week's project uses layered felt to make ornaments, appliques, pins, hair clips, and whatever else your imagination comes up with! I love felt! It's inexpensive, comes in lots of bright colors, and is easy to work with. My grandmother used felt to teach me to sew doll clothes. 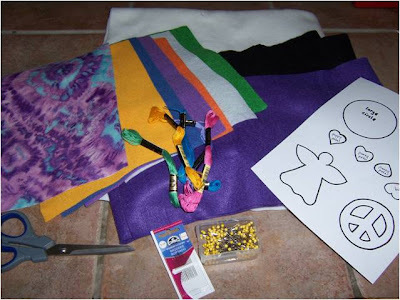 I'll be giving you the patterns and instructions to make the layered felt pieces above - feel free to use them, invent your own, or change them up. When you're deciding which colors to use, there are two different ways you can go. Choosing colors intuitively works real well for some people who are naturals at this and not so well for others! I put together a color planning page you can use as a tool for this or any other project. We will be using four embroidery stitches: blanket stitch (refer to this post if you do not know this stitch), outline stitch, lazy daisy stitch, and french knots. 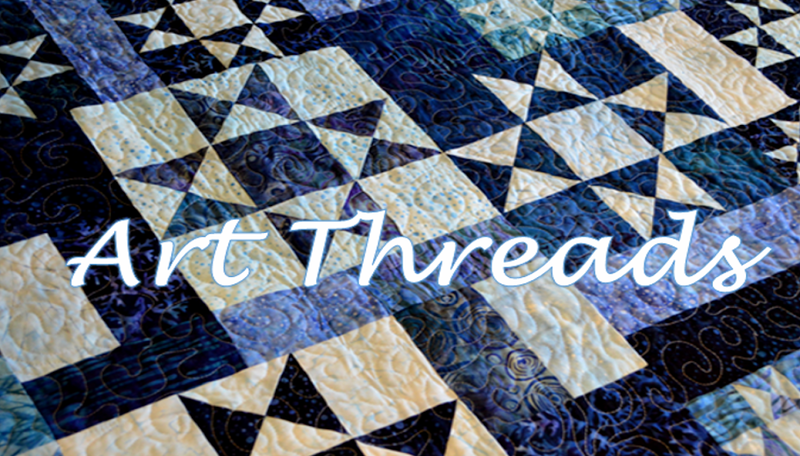 Tie a knot in the embroidery thread and bring the needle through the fabric from the back to the front. 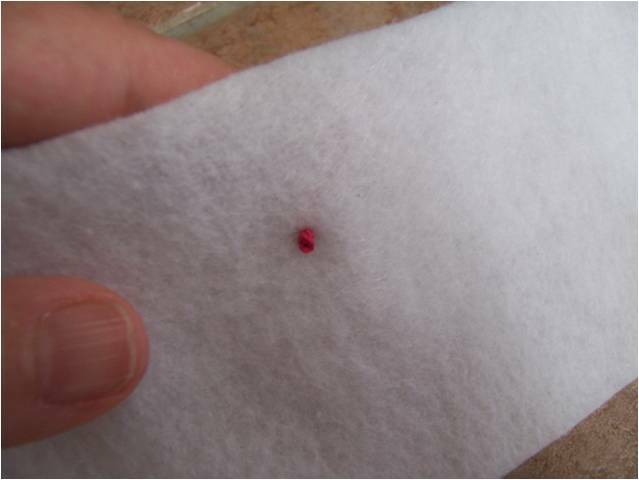 Put the needle into the fabric about 1/4 inch from where you came up and bring the needle up where you first began. Pull the thread through. 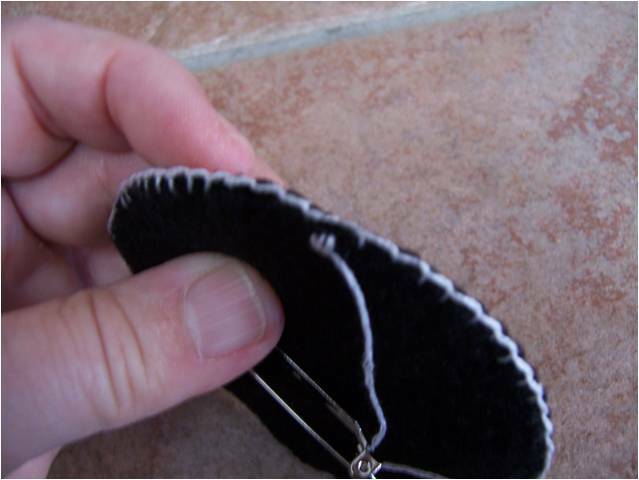 Put the needle into the fabric about 1/4 inch from the hole furthest to the right and bring the needle up in that hole furthest to the right. Pull the thread through. Continue as above until your line is the desired length. Tie a knot in the embroidery thread and bring the needle from the back of the fabric to the front. Above the hole the needle came up through, make a loop of the embroidery thread. Insert the needle into the hole it first came up in and come up above the hole. How far you come up from the hole depends on how long you want your daisy petal to be. Experiment with different lengths. Pull thread through and put needle down through fabric directly on the other side of the thread. Pull thread through. Bring thread up through original first hole. Repeat above until flower is formed. This stitch can also be used for leaves. 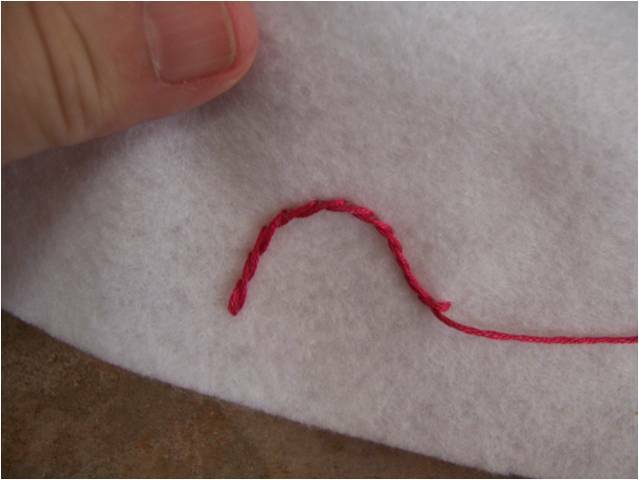 Tie a knot in the end of the embroidery thread and bring needle up through fabric from the back to the front. Holding needle in one hand and the thread taut in the other, wrap thread around the needle 2 to 4 times. The more you times you wrap the thread, the bigger the knot will be. Holding the thread tightly with your left hand, insert the needle down very near the hole it came up through. If you go back down the exact same hole, the knot will often fall through the hole to the back of the fabric. Keep holding the thread tightly until you have pulled it all the way through to the back. It probably sounds odd to talk about finishing our pieces before we've begun them, but what you decide to do with your felt in the end will cause differences in how you put it together. 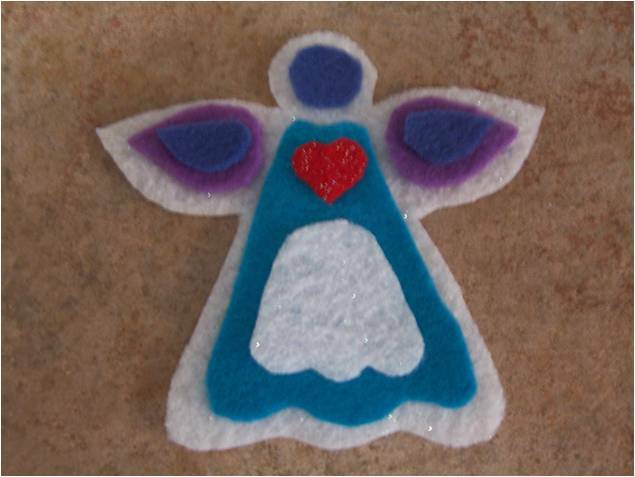 Applique - I use Eco-Fi (also called Rainbow Felt), a felt made from recycled plastic that can be put in the washer and dryer, so I could decide to use my layered felt as an applique. If this is what you want to do, do not put a back on it. Instead, when you are finished with the front, pin it to a piece of clothing and attach using a blanket stitch as in this post. Because this felt is made from plastic and must be ironed at a lower temperature, skip attaching the applique with Steam-A-Seam. 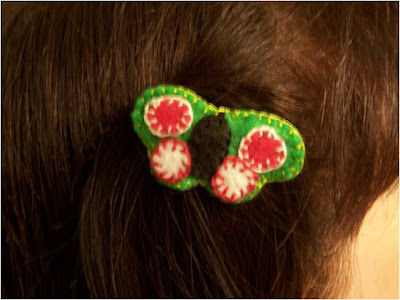 Just pin it on and attach with a blanket stitch. 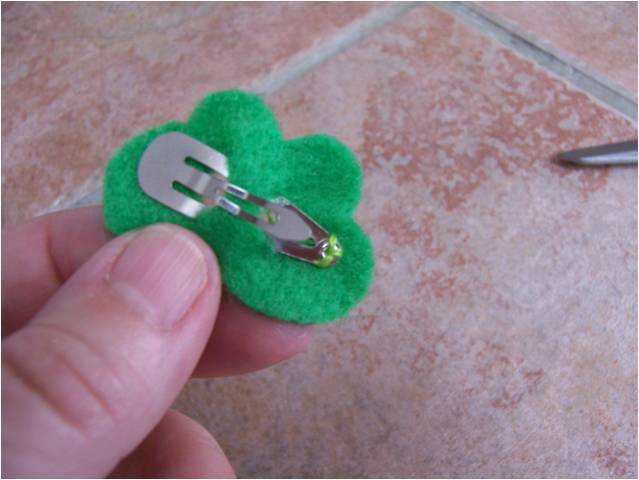 Pin - When you finish the front, attach a pin back (available in the jewelry findings section of craft stores) by sewing it to the outside of the back piece. Then attach the back to the finished front piece using a blanket stitch. Hair Clip - Hair clips are available in the jewelry findings section of craft stores or the hair care section of grocery or drug stores. Take the backing piece and cut two small holes. Insert the large side of the clip through the holes. 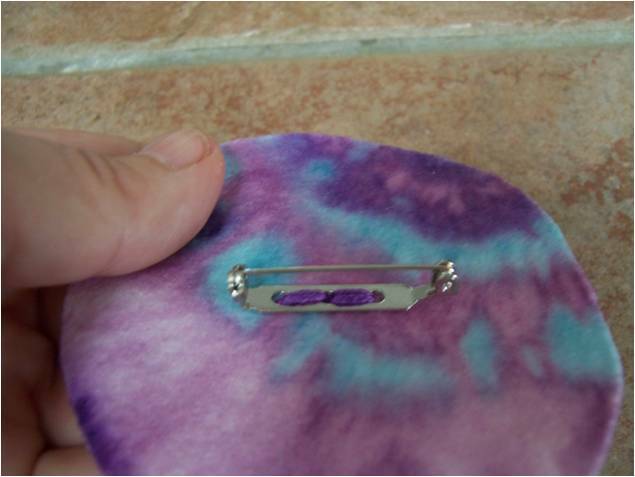 Sew a few stitches through the hole in the large side of the clip. Attach the finished back to the finished front piece using a blanket stitch. Ornament - When you finish the front, attach a looped ribbon to the back of the finished front piece by sewing it securely on (make sure you don't sew all the way through the front). You can also make a braided hanger. Cut three colors of thread about 1 foot long. Thread a large eyed needle with all three threads, find where you want the hanging loop to be, and attach to the back of the finished front piece, making sure you don't go through to the front. 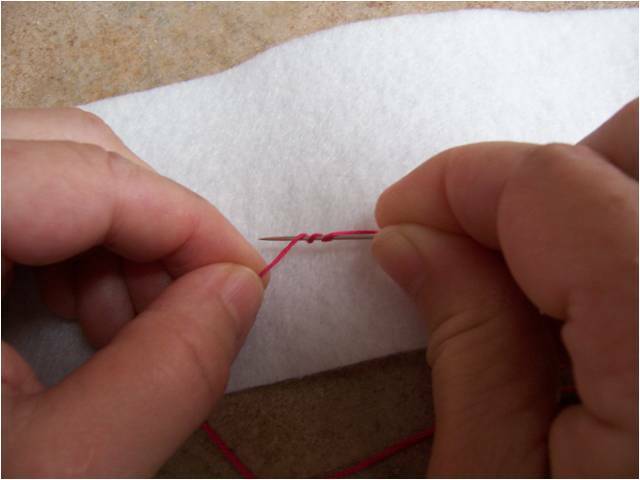 Remove needle and tie all three threads together in a knot, leaving about 2 inches beyond the knot. Braid the thread until you have a piece long enough to form the size of loop you need. Tie the end of the braid in a knot and trim the extra thread, leaving about 2 inches beyond the knot. Tie the two ends of the braid together, forming a loop. Attach the finished front to the back using a blanket stitch and being careful to keep the loop formed. Whichever of the above finishing methods you choose, finish by bringing the needle up to the back piece, make a few short stitches, and weave the thread back and forth through the stitches several times before cutting close to the weaving. Okay! Now we're ready to make our layered felt pieces. If you haven't already, print the patterns and cut them out. 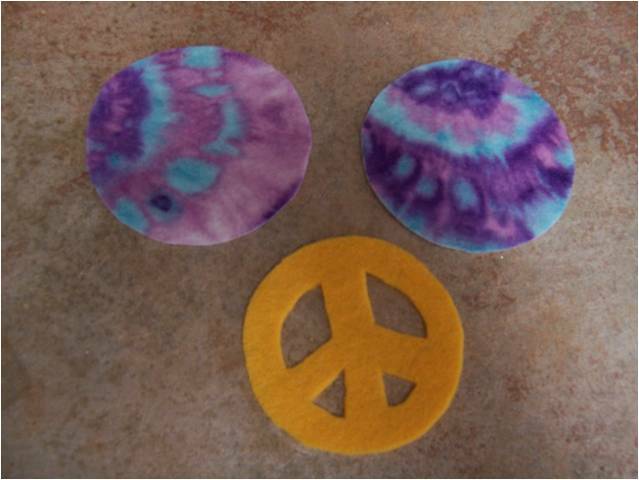 Cut out two large circles (one for front, one for back) and one peace sign. 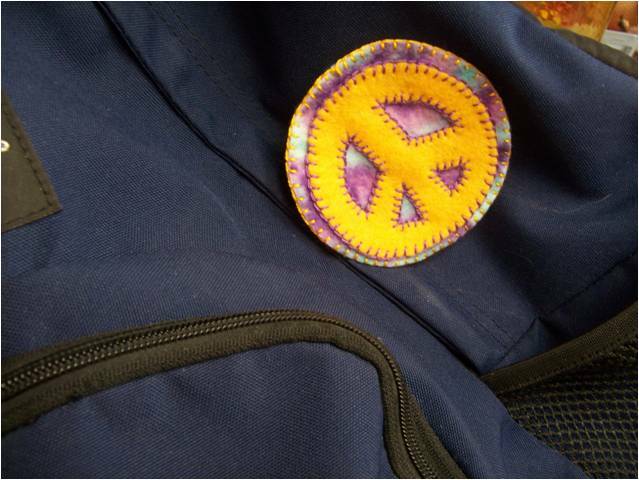 Sew the peace sign to one of the large circles using a blanket stitch. Finish in one of the ways described above. Cut two butterflies (one for front, one for back) using pattern. Freehand, cut circles or other shapes to decorate your butterfly. Attach the decorative pieces using a blanket stitch. Finish in one of the ways described above. 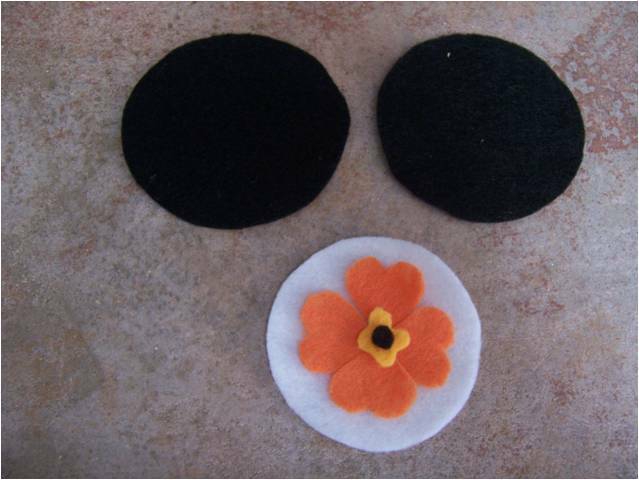 Cut out two large circles (one for front, one for back), one small circle, and four poppy petals using the patterns. Cut a small wavy center and a small circle freehand. 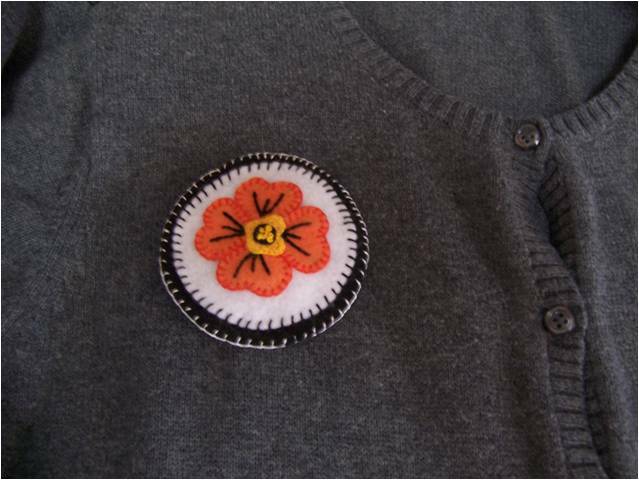 Attach the poppy petals to the small circle using a blanket stitch. 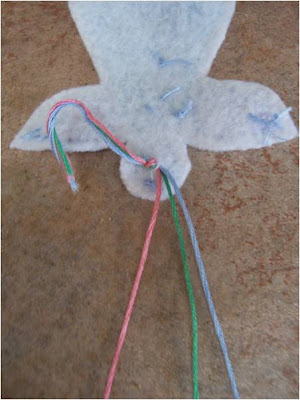 Using an outline stitch, sew lines on the petals. Attach the wavy center and then the small freehand circle. 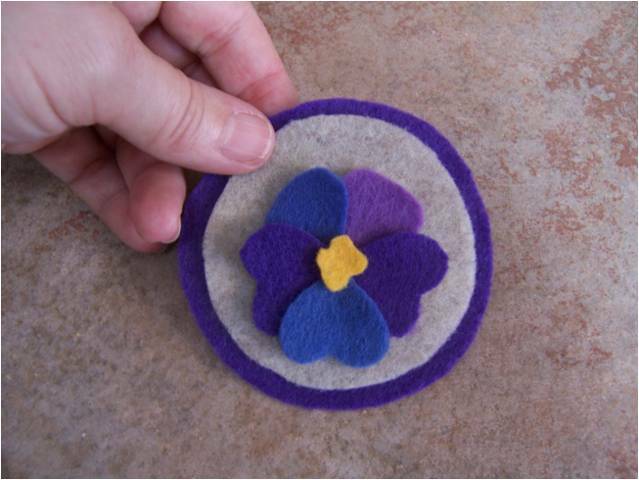 Make french knots in the small freehand circle. Finish in one of the ways described above. 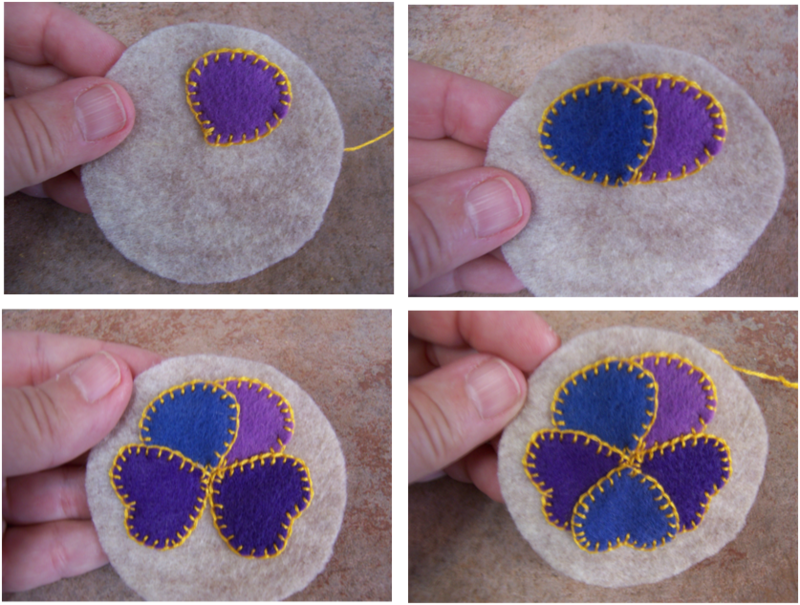 Cut out two large circles (one for front, one for back), one small circle, three heart shaped pansy petals, and two tear drop pansy petals using the patterns. Freehand, cut one small, wavy center. Attach the right tear drop petal. Attach the left tear drop petal. Attach the right and left heart petals. Attach the center heart petal. Attach the wavy center. 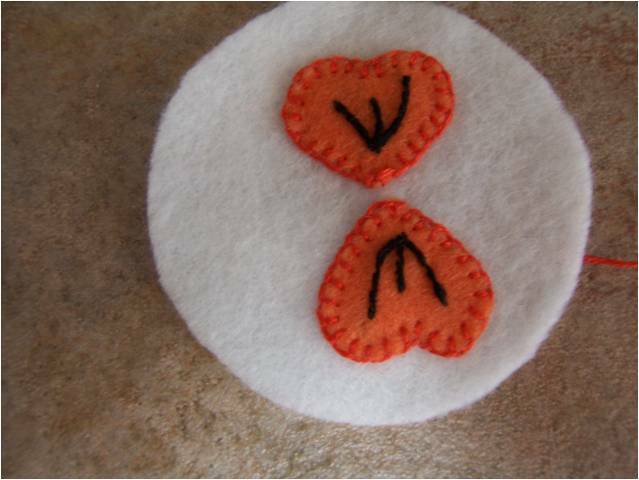 Add french knots to the center. Finish in one of the ways described above. Cut two angels from pattern. You can add additional parts to design the angel in whatever way you want. 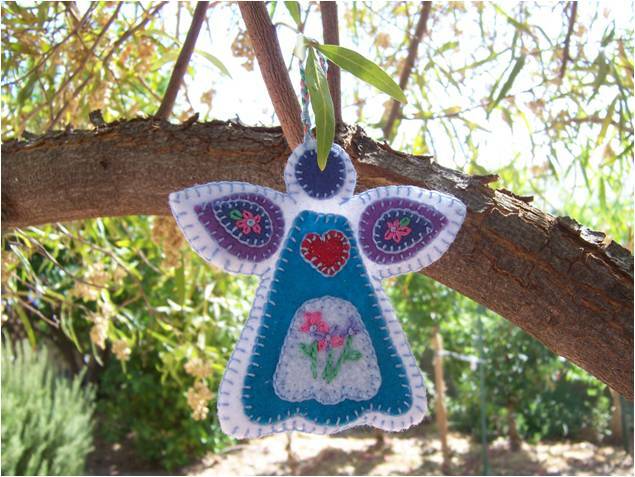 If you want to make one like mine, print out the additional angel pattern and cut the pieces out. Embroider apron with flowers, using a lazy daisy stitch. 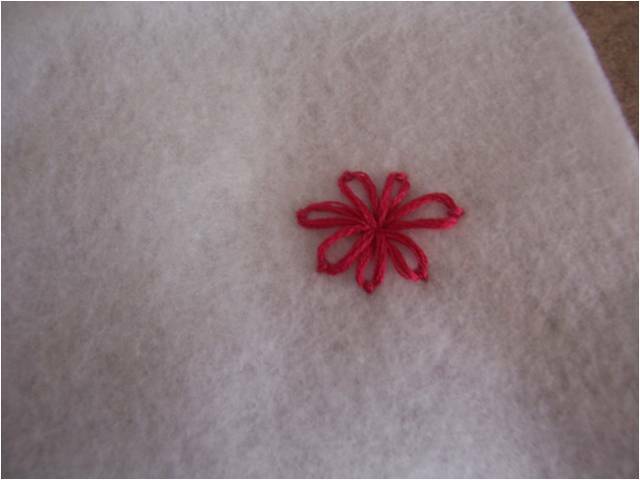 Add stems with an outline stitch and leaves with a lazy daisy stitch. 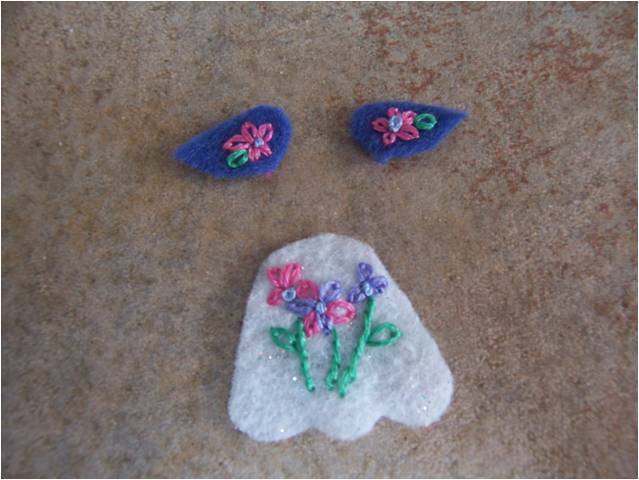 Put a french knot in the center of each flower. Add a flower and leaf to each top wing piece. 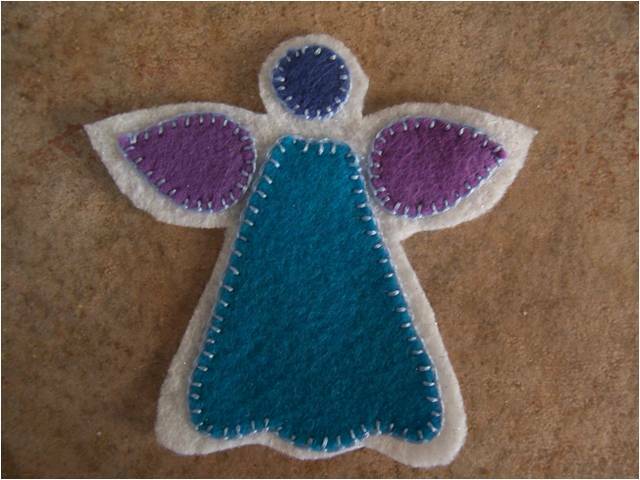 Attach face, lower wing pieces and dress piece using a blanket stitch. 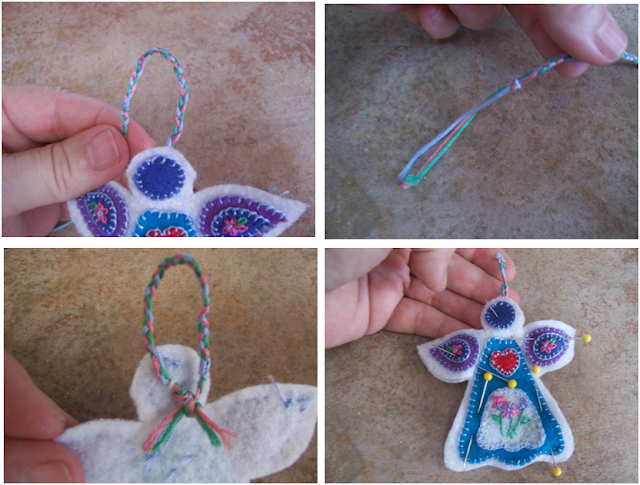 Attach heart, upper wing pieces, and apron using blanket stitch. Finish in one of the ways described above. 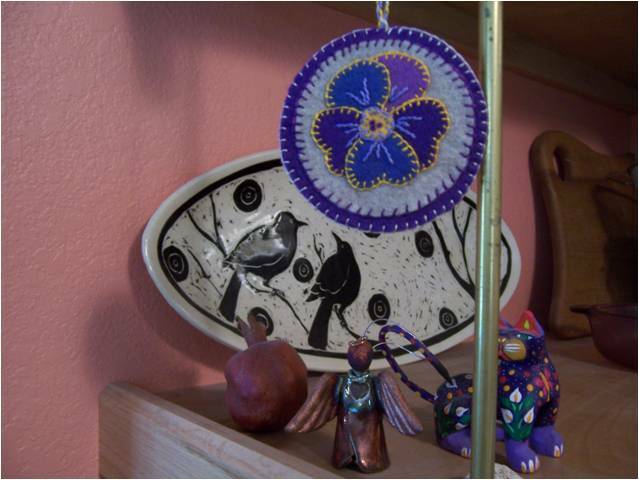 Try developing your own patterns, looking at images of flowers, folk art, and clip art. Another great bunch of ideas that could keep you going for weeks! MUITO MUITO BOM TEU BLOG E O MELHOR QUE VOCÊ MOSTRA CADA PASSO ISTO É VERDADEIRAMENTE UMA AULA PARA QUEM GOSTA E ESTÁ INTERESSADO, MUITO OBRIGADA POR DIVIDIR.